I bought this comic umpty thrumpty years ago. In those far off early days of the Marvel age I would read EVERY WORD of each comic, including close analysis of the classified ads. It really seemed to be another world compared to my Beezer Comics. So I thought I’d do a review of Journey into Mystery 119 cover dated August 1965. When I purchased this comic new it would have been approaching Xmas 1965 and yet it would have only recently arrived on the spinner rack. They really ought to have printed a later date on the UK covers whilst they were changing the price from cents to dinerias. The anthology horror,mystery and monster stories were now long gone. The title character was starring in his 37th consecutive issue. The one page text story was now replaced with a letters page. I notice that the “Pop Art Production” logo appeared for the first time this month. After 4 issues that experiment was terminated unlike the DC “checkertape” along the tops of their comics in 1966 which survived a whole year. 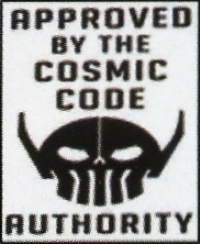 The Comic Code seal is displayed prominantly. The indicia/small print was still being printed at the bottom of the inside cover. Here we learn that Journey Into Mystery is published by Atlas Magazines Inc of 625 Madison Avenue New York. No mention of Marvel Comics. There was a note that Martin Goodman was the publisher though. (Even today the ownership of the “Atlas Comics” name seems to be in dispute…at least the Atlas/Seaboard 1970s version…) And look, a foreign subscription would have cost me $3.25 in american funds…but where on earth apart from america would I get american funds?….all I knew about in 1965 was UK coins, stamps and postal orders. Page 8 required much scrutiny as it was a full page advert for the Honor House Production Company. They sold novelties you couldn’t live without/didn’t need at all and were similar to our own Ellisdons. Skipping past page 13 which was only a boring ad about training to become a motor mechanic we reach page 18 with a house ad for four other comics from the Marvel Universe. If you hadn’t already aquired these it was time to memorise the covers for the future…even the Sgt Fury one. Page 19 has more odd ads. Earn money by selling Grit whatever that may be????? On page 23 the oddly named Slimline Company entices you to long for some X-Ray spectacles. At page 24 we reach the classified ads. These are mainly for stamps. Over the next 10 years classified ads would begin to appear offering old comics for sale. My scanner isn’t lop-sided. Most of the printing in this comic is though!! Page 25 is a full page advert for the first ever Journey into Mystery Annual. A must-have, even though it would cost 1/6 when my weekly pocket money was a mere 2/6. But why only 72 big pages when DC had 80 page giants for the same money? Page 29 was another full page of odd ads like this one. Page 32 featured all sorts of good stuff. I coveted a Spiderman T-shirt and would have liked to see my name amongst the list of “merry marchers”. I recall I did once own a Hulk sweatshirt. The one where on the front you see him walking towards you dragging a thick rope. On the back of the sweatshirt you see a rear view of the Hulk and realise that the rope is attached to a small wooden duck on wheels………. Is there anyone famous on the letters page? Many early contributors went on to a career in comics. Now it’s time to check the checklist. Three full page ads for hit records, US Army Surplus and Wallace Brown Inc Xmas cards on approval round out the comic. Well all that kept the young me amused for at least an hour….and there were still the delights of a Mighty Thor story and a Tales of Asgard story to read and digest…at least twice!! !